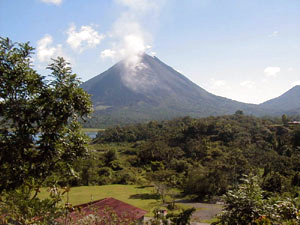 La Union is a tiny community on the north side of the lake between Nuevo Arenal and the dam at the eastern end of the lake. In La Union is the popular tourist stop, Toad Hall, with its very nice gift shop and pleasant lakeview cafe. Almost next door is the luxurious La Mansion Inn, with a fine restaurant and 17 cottages/villas scattered downhill toward the lake shore. Farther east is the Las Heroes Hotel, "an authentic Swiss lodge in Costa Rica," where there is another restaurant. 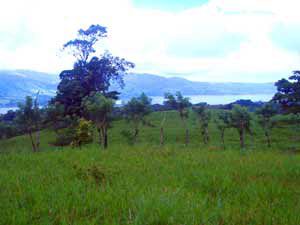 Behind La Union, the hills rise steeply to broad expanses of pastured and forested hills where you may be able to find acreage to suit you and where a development is starting to take shape. Volcano views from this area are of course very fine and across the lake one can see the areas of Tronadora and Rio Chiquito. H35 Fine remodel upscale 2 BR 2 BA home on 1 acre with river and forest, $275,000. Adjacent 13/4 acres with two cabinas, $175,000.